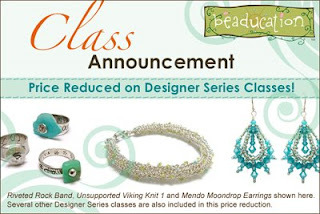 Beaducation: The Blog: We've Lowered the Price on Our $38 Classes!!! We've Lowered the Price on Our $38 Classes!!! Why the price break you ask? Well, we have streamlined the process of producing our online classes and want to pass the savings on to our customers. Also in order to keep class prices accessible in these difficult economic times we have decided to lower our highest priced class. That means all of our $38 classes will drop to $28. That's a $10 savings!! The prices for the $12 and $20 classes will remain the same. If you have been putting off taking a class...the time is perfect for you to jump in. Also, to give our students more information on the class, we are categorizing our classes into two new groups. The "Designer Series" will focus on classes that are a signature class of the instructor. This means the class is one of the instructor's specialties! The "Technique Series" will concentrate on teaching a general jewelry making skill. You may still do a project in these classes, but the technique is adaptable for many designs and may be a prerequisite for other Beaducation classes. We have a bunch of new classes coming up in the next few months with great instructors and inspiring projects. We hope you enjoy our classes as much as we love to bring them to you. Do you have feedback for us? Feel free to let us know your thoughts, concerns or questions.